After discovering their hands, babies need to learn that they can activate them, make use of them Ten-week-old Emma lies comfortably watching the toys of her activity gym hanging above her. She is focused on the colorful toy hanging within reach of her hand. She looks at the toy for a few seconds and then suddenly, puts her hand out and swings it towards the toy and … misses. Emma doesn’t give up. Pushing her hand out again, she seems to be assessing the distance and then she strikes again. This time her hand hits the right spot and the toy swings happily back and forth. A broad smile spreads across Emma’s face. Emma is busy developing the coordination between her eyes and her hand. She is trying to learn how to bring her hand directly to the object she is focusing on. It’s difficult for us, as adults, to understand the significance of the concept of “hand-eye coordination” because we take this coordination for granted. When we look at an object and want to touch it, we don’t hesitate even for a moment, and we don’t give a second thought to the task at hand. Our hand moves as though of its own in the direction of the object, and closes exactly at the right place. This obvious action is the result of many months of learning during the first year. Let’s “go back” to this period for a moment and try to understand the process that a tiny baby has to go through in order to learn the obvious coordination between hand and eye. Newborns don’t associate what their eyes see with what their hands do. Often their eyes look in one direction, while their hands move randomly in another. Babies can’t move their hands toward an object they see. Furthermore, they are still unaware that these hands, which belong to them, are part of their bodies. Most of the time their hands are outside of their vision, and they are not even aware of them. Babies first have to discover that they have hands. This usually happens at about six to eight weeks. Babies discover their hands through touching. They grab one hand with the fingers of the other hand. They pull on them, and open and close their fingers. At this stage, their movements are usually random; they don’t yet lift their hands in front of their eyes to intentionally look at them. At six to eight weeks, objects that make noise, such as a rattle, should be put into baby’s hands. Newborns are born with a gripping reflex, automatically clasping their hands around an object placed in them -- they will therefore also grasp a rattle put in their hands. Then, when they move their hands randomly, they hear the rattling noise and look for the source of the sound with their eyes. When they discover the rattle, they will also discover the hand grasping it. Light toys that can be held and make sounds when shaken, are known to be significant during the weeks that follow. They draw babies’ eyes and attention to what they are holding in their hands. They help babies establish the connection between themselves and their hands. When they have learned to intentionally bring their hands within their vision, their hands become their most fascinating toy. They don’t take their eyes off of their hands; they wave them in front of their faces, examine them in amazement and play with them endlessly. After discovering their hands, babies need to learn that they can activate them, make use of them. 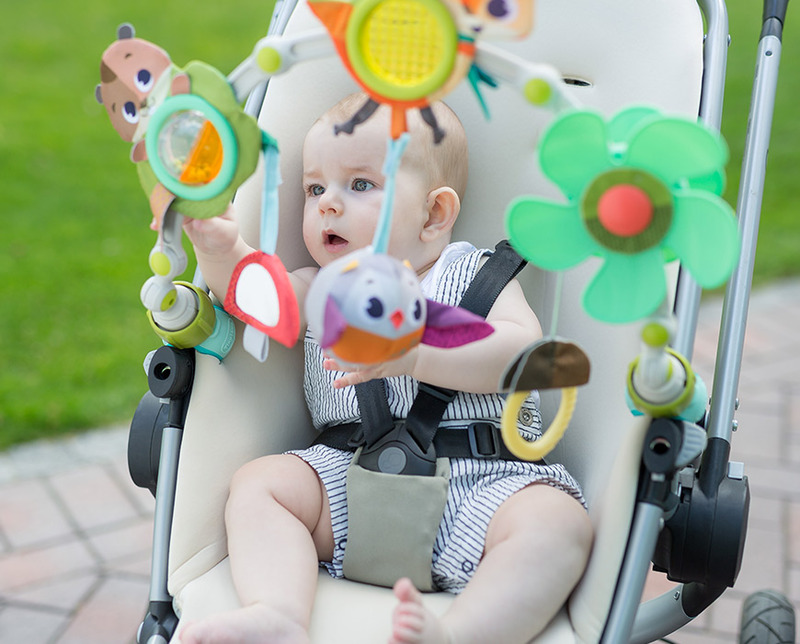 When your baby reaches three to four months-of- age, it’s important to hang toys that can be batted or struck,, above where she lies. When babies lie on their backs under such a toy, an interesting process begins to take place. They focus their eyes on the toys and look at them gleefully. At the same time, they will move their hands or feet randomly until suddenly something wonderful takes place: their hand will touch a hanging toy and the toy will swing back and forth. After several such random strikes, they will begin to understand that they control the process, and the random strikes become more and more intentional. If babies could describe their experiences verbally at this stage, we would surely hear them say something like: “Hey, am I doing this wonderful thing? Do my hands have the power to do something so great? Maybe I’ll try it again.” Gradually babies learn to direct their hands and bring them to the objects that they are looking at. This is when hand-eye coordination is established. Once hand-eye coordination has improved and is established, babies are not happy just to bat at a toy. They want to touch the objects so they begin to assess the distance between themselves and the object that they want to touch. They move their eyes from their hands to the object, and back again, many times and only then, once they have assessed the distance, they put their hands out and touch the object. Gradually, this process becomes more accurate and they can stretch out their hands directly to the object and touch it without hesitation. At about five to six months, babies can bring their hands directly to an object within reach, and have even learned to grasp at just the right moment and … catch and hold on to the desired object. When babies begin to want to touch objects and hold them and are not satisfied with just looking at them, it is important to place toys that don’t fall over within their reach. They need to have something that doesn’t move hanging above them, so that they can reach out and touch without it swinging and slipping away all the time. 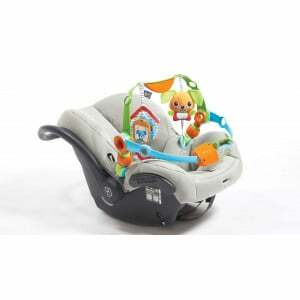 At this stage toys that move away can frustrate and disappoint the baby. 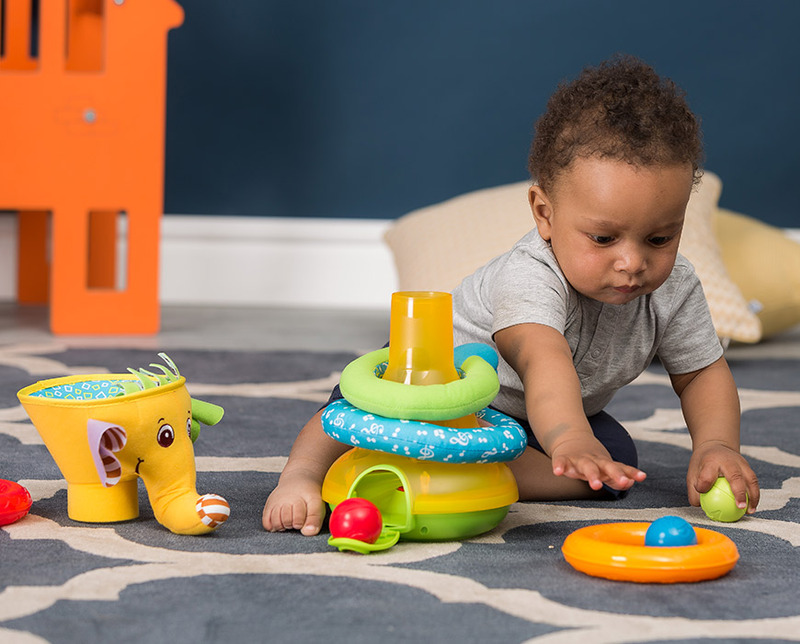 Now you can directly train your baby to intentionally touch and grasp objects: Hold an eye-catching toy in front of your baby, within reach, and wait patiently until he reaches out and touches it. Do not move the toy closer. 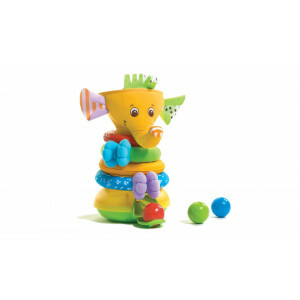 Try holding the toy at a fixed distance and wait patiently until your baby’s hand reaches it. Your baby will gradually become quicker and more skilled at doing so, until he succeeds in reaching out directly to the toy. You should hold out objects for your baby to touch while he is in different positions, so that he can improve this ability. You can shake a rattle within hands-reach while your baby is lying on his back or on his tummy so that he will have to stretch in order to reach it. You can also shake the rattle behind his back while someone else is holding him, so that he will have to turn around and stretch his hand out in another direction. From the age of about four months your baby will start bringing the object he is holding in his hands to his mouth. During the first year, baby’s mouth plays an important role in his development. Babies examine, explore and discover the world around them with their mouths. Later, from about six months, their hands also join in and they begin to examine the objects that they are holding – to touch, tap, rub, stroke, squeeze and so on. By now, hand-eye coordination is already established, and babies can move on and begin to improve their fine motor movements and skills,-- the coordination between both hands, and their hand-eye coordination involving more difficult tasks. Hand-eye coordination continues improving over many years. Imagine what remarkable coordination between eyes and hands has been achieved by a pianist sitting at his piano. He glances at the sheet of crowded notes, moves his glance quickly from the sheet to the piano and back again, and hits his fingers precisely, and with perfect coordination, on the keyboard. This is so quick that it is sometimes difficult to see his hands, which have become a blur of movement. This skill requires especially sophisticated and well-developed hand-eye coordination. However, every day actions such as bringing a spoon of soup to our mouths, holding a pen and drawing a circle or threading a needle, also require good hand-eye coordination. Your baby, toddler and child will learn these tasks through hard work and daily practice.